Tharamangalam (also transliterated as Taramangalam) is a panchayat town in Salem district in the Indian state of Tamil Nadu. Tharamangalam is located at 11.70°N 77.98°E﻿ / 11.70; 77.98. It has an average elevation of 275 m (902 ft). It is located in the Salem District in northwestern Tamil Nadu, and about 27 km west of Salem city. Tharamangalam is famous for its beautiful and historic Kailasanathar temple. 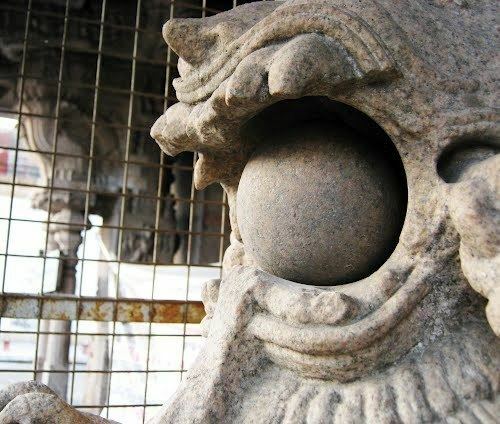 The temple features exquisite stone carvings of the Yali (mythological dragon), depicted with an actual stone ball inside its mouth (one can even put one's finger inside the Yaali's mouth and rotate the ball). The Kailasanthar Temple also has a carving of Rathi looking at [Manmadhan] , where if you look from Rathi side manmadhan is visible but if you look from Manmadhan's side, Rathi is not visible since she is supposed to be hiding from Manmadhan's. Also depicted at the temple is a scene from the Hindu epic Ramayanam (Vali & Sukrivan fighting, depicted on one pillar, and Lord Ram with bow and arrow aiming to kill Vali depicted on another pillar).It is also has a special parrot and flower statue on ceiling of the temple which can be rotated. And it has a special vinayagar statue on which if you pour water it will go to a well below it and you can't see through which the water travels through and you can hear the falling sound of the water.And the temple has a secret underground way which the king who build the temple uses to travel to another temple called Sokkanather temple located at Amarakundhi located 6 km from tharamangalam. During the Tamil month AVANI on certain only three days the light of the sun will fall on the head of the sivalinga statue in evening which will not happen never in that year. It is a Siva temple, perhaps the most beautiful of its kind in Salem District. Parts of it existed as early as the tenth century; as it stands now, it is the product of the Gatti Mudhali dynasty of the seventeenth century. Reconstruction and elaboration of the old temple was begun by Mummudi Gatti Mudaliyar, continued by Siyazhi Gatti Mudaliyar, and was brought near completion by Vanangamudi Gatti Mudaliyar. This west-facing temple is enclosed by a massive stone wall measuring 306 by 164 feet (93 by 50 m) reportedly built in the thirteenth century. The main entrance tower (5 storeys 90 feet (27 m) high) is conceived as a chariot on wheels, drawn by elephants and horses. The huge entrance doors, made of vengai (pterocarpus marsupium) wood, are studded with unrusting iron knobs each of a different pattern. Their panels are decorated with wooden carvings depicting incarnations of Vishnu. The entrance to the inner sanctum is through a portico supported by six sumptuously carved stone pillars. The scenes of tiger hunting by princes seated on horses and accompanied by footmen are depicted very realistically and with great sensitivity. A pillar of yazhi (a mythical animal combining features of the lion and the elephant) is so ingeniously carved that a stone ball (4' diameter) in its mouth can be freely rolled but cannot be rolled out. The wooden doors of the portico are adorned with twenty four panels of excellent carving, some of which have been vandalized. The motifs for these carvings are drawn from the divine exploits of Siva and scenes from the daily lives of ordinary people. The great hall is a fine gallery of sculptures of men, women, and gods, among which the sculpture of the voluptuous rishi pathini (sages wife) is notable. The ceiling is supported by rows of stone pillars from whose capitals hang elegant chains carved out of solid stone. The ceiling in front of the main shrine is covered by a block of stone seven feet in diameter carved in the shape of an inverted open lotus with parrots. This carving is surrounded by the Gatti Mudhali insignia. The outer walls of the inner most sanctum are covered with inscriptions. Every year on February 21, and the subsequent three days, a great solar and architectural wonder can be seen in the temple. During sunset, the rays of the sun travel down through the front Gopura at the temple's entrance gate and through a small hole in the and travels across the front plane to fall directly onto the statue of Siva. The movement of the sun beam can be witnessed as it progresses across the front of the temple, making the lingam appear to glow. Several gigantic monolithic pillars of pink granite carved, polished, and ready for erection in the proposed Thousand Pillar Hall lie outside the temple. More are said to be under the ground. Before this project could be completed, Vanangamudi Gatti Mudaliyar was killed in 1667, leaving the foreground of the temple littered with ruins of a noble dream. A temple tank (about 180 by 180 feet (55 by 55 m)) is one of the finest of its kind in South India. Thirty-six Nandhi sculptures (two feet high) of black stone sit at intervals on top of the parapet wall whose inside holds 365 lamp niches, one for every day of the year. Only once in 1873 the pool was cleaned by the Salem Local Fund Board. Sri Kaarkisvarar temple, Sri Marriamman and Sri Selliamman temple, Sri Subramaya Swamy temple and Perumal and Sri Iyyappan temple are other major temples. The town also has a small public library which is located center of the town. Tharamangalam has a very active economy with high number of small scale textile units, handloom & powerloom units producing curtains, sarees, pillow covers, towels, doormats and numerous other textile products that are traded all over India. There are large number of coconut plantations across the town as a result of which there are many coconut coir units which makes coconut fiber ropes, coco piths and are exported to Canada and other extreme winter weather countries. Many other byproducts of coconuts are also manufactured in this town. The town is also a junction for heavy vehicles plying between Mettur, Sankagiri & Salem Steel Plant which as a result brings in more business for traders and shop-keepers. Apart from textiles there are many PVC companies manufacturing plastic pipes, plastic pots & over head tanks. Tharamangalam is a major producer of raw milk. All major dairy companies like Aavin, Hatsun, Milky Mist etc have got multiple milk collection centers. Small scale animal feed manufacturing units are functional in the town. Medium-sized rice processing units are also present and operational. Ivory Gull Candy Company has a confectionery manufacturing unit in Pavalathanur, Tharamangalam. Salem, 18 km away, is the nearest major city to Tharamangalam and is well-connected with public and private bus services. Salem also has the nearest major train junction (station), from which metropolises such as Bengaluru and Chennai are just a few hours ride away. Airport is located on Salem-Bangalore Highway (NH-7)in a place called Kaamalapuram which is about 20 minutes drive from the city. After long time,Kingfisher airlines launched an ATR-72 daily service flight to Chennai on Nov 2009 . Salem Airport is being connected by Kingfisher Airlines from Chennai. The other nearest major airports are at Trichy (150 km) and Coimbatore (160 km).